This weeks Pic(k) of the week looks a bit different! Last Thursday we went out for the first a desert drive of the winter season with three 4x4 cars. A classic way of escaping the hustle and bustle of Dubai city! A great BBQ finished it all off. As usual, people visiting friends or family come along for the ride as well. One of them was Timmy from Sweden, which quickly became the "Desert Acrobatic". Thanks Timmy! Best viewed on a high resolution monitor, click on the image and then select O (original) from the image size. 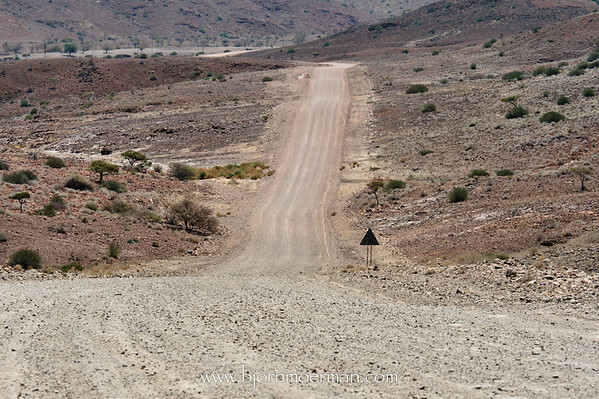 Leaving Etosha through the South-West gate, we were now headed to the heart of Damaraland. Very similar to the scenery of Monument valley in the US and often called the Utah of Namibia, we stayed at the Vingerklip lodge. This place on a 3000ha (yes!) farm, with its huge eroded rock formations, turned out to be great for landscape photography. The following day we made a quick stop a the Petrified forest. 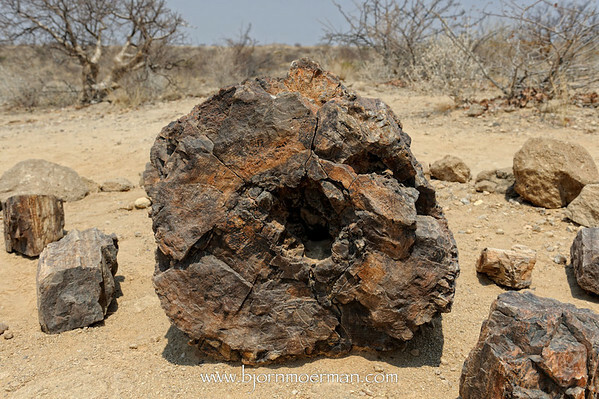 A place full of fossilized trunks of trees, that came to their final resting place an estimated 280 million years ago after floodings brought them here from central Africa. 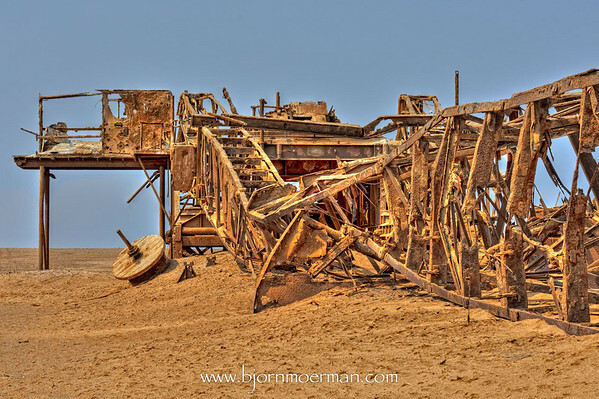 Later in the afternoon we got to the "Skeleton Coast National park", a park where one can drive for hours without seeing anybody and which protects the top third of the Namibian coast. The only option to stay inside the park, Terrace Bay Resort, turned out to be a great. It consists of about 10 small cabins on the deserted beach and has an excellent restaurant. The whole village counts 50 people! The next one down the road is 3 to 4 hours away. The end of the world! During my initial preparation I bumped into some interesting images of a dis-used oil rig hidden in the dunes. Looking for the correct GPS coordinates online payed off. 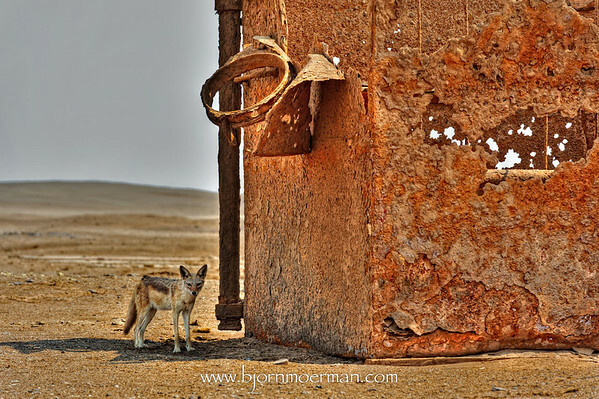 A family of jackals lived in the rusty structure and it turned out to be a good place for some HDR (High Dynamic Range) photography. 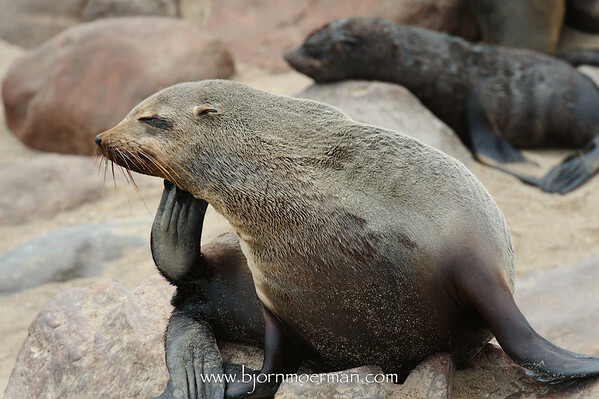 Just a few hours North of Swakopmund, which was our next layover place, we visited the Cape Cross Seal Reserve. With about 300 000 Cape Fur seals living here, it is the largest land based seal colony in the world. Oh boy it was smelly! Part 4 of this series (probably the last one), will pick up from Swakopmund on our way to one of the other highlights of the trip. 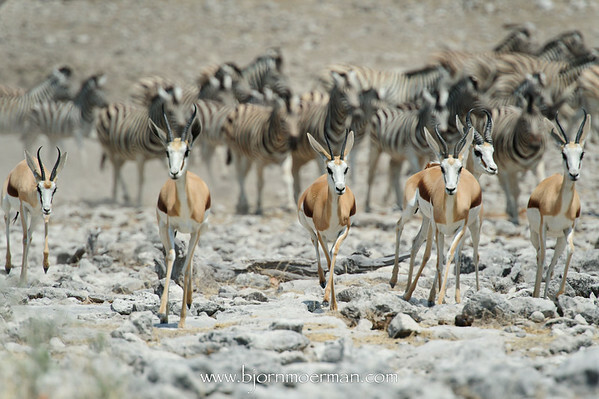 The second day in Etosha we spend in the middle section of this huge wild-life paradise. 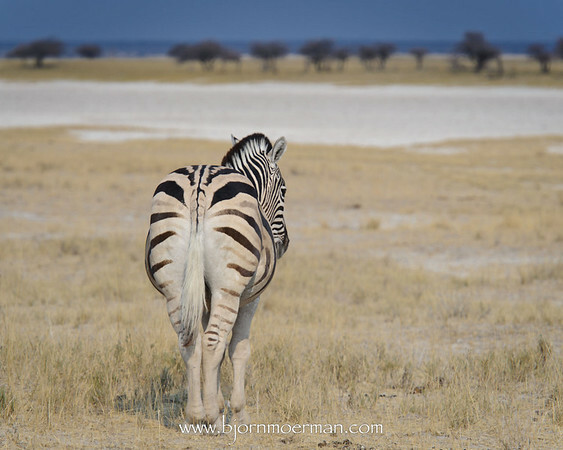 It turned out that looking up all Etosha waterholes was a great idea. Entering them in my iPad 3G (with GPS) would prove to be very useful. 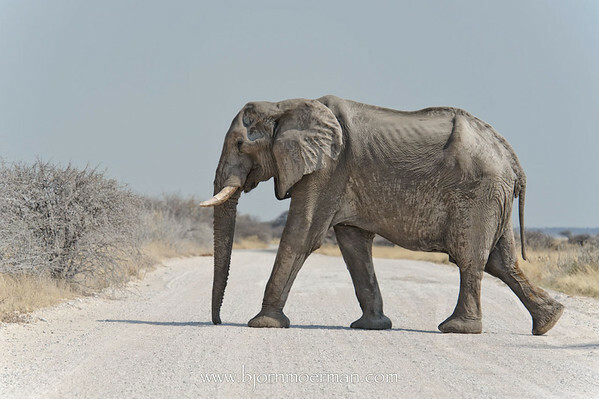 While driving between two waterholes early in the morning, we bumped into (not really!) this Rhino. We saw her approaching from a distance and immediately stopped the car and switched off the engine, while waiting for this mighty beast to pass. She turned out to be crossing only a few meters in front of our car, completely neglecting our human presence. Etosha has a lot of open space, mostly covered with grass. Excellent for landscape shots like this one. Zebras are probably the easiest to photograph. Sometimes it even looks like they pose for the camera. 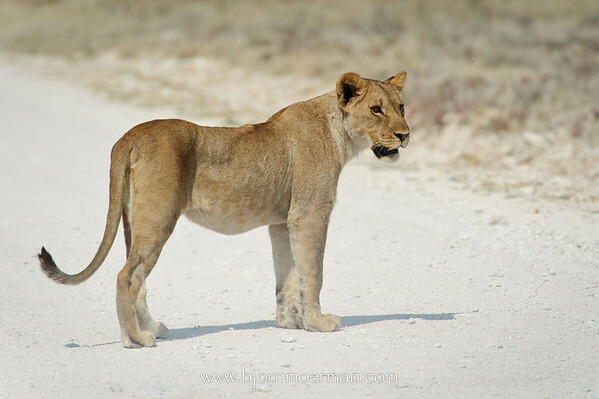 Very similar to the Rhino encounter, we had 1 lion and 4 lionesses crossing our path. The white ground makes for a great light reflector. Just a short while later, we arrived at the Homob waterhole where lots of Springbok and Zebras were staring in the same direction. Something was not normal. They felt (or smelt) the presence of the 5 lions we had just encountered and were ready to do a runner whenever they would sight them. 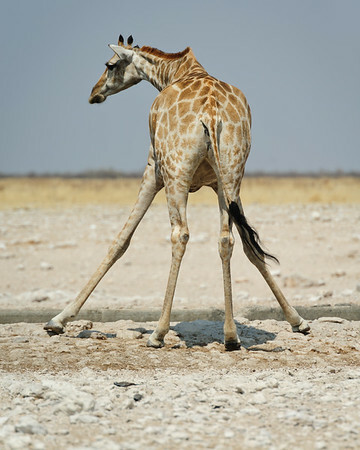 A drinking giraffe is always a funny site. This one at the Gemboksvlakte waterhole is a good example. Next was a large herd of elephants taking a mud bad at the Nebrownii waterhole. The contrast between the Springbok and the Elephant makes for a nice shot. 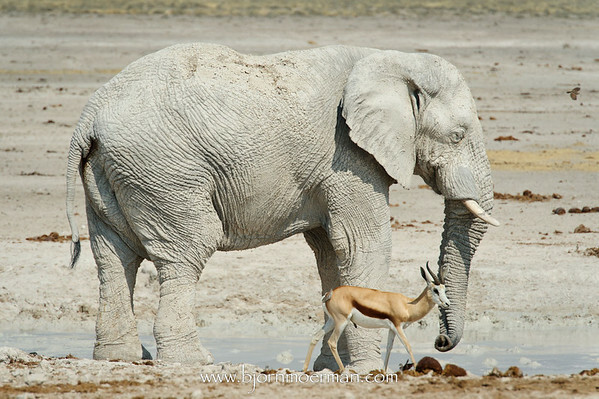 The Etosha salt pan does not attract a lot of animals because of the lack of shelter and the potential danger from predators. A few ostriches and a giraffe were the exception! 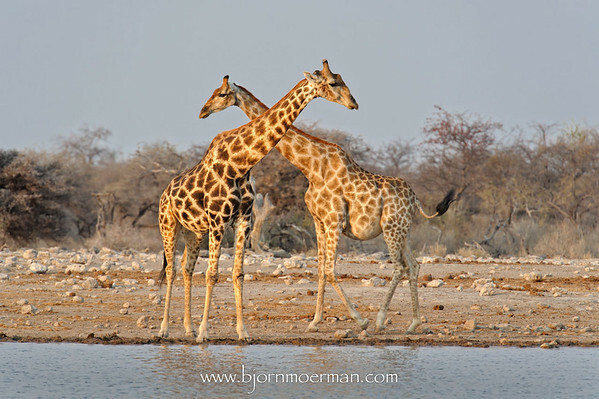 One of the best waterholes in Etosha is without doubt the Okaukuejo one. It has a large viewing deck where guests at the camp spot and lodge can spend the evening/night watching the animals. 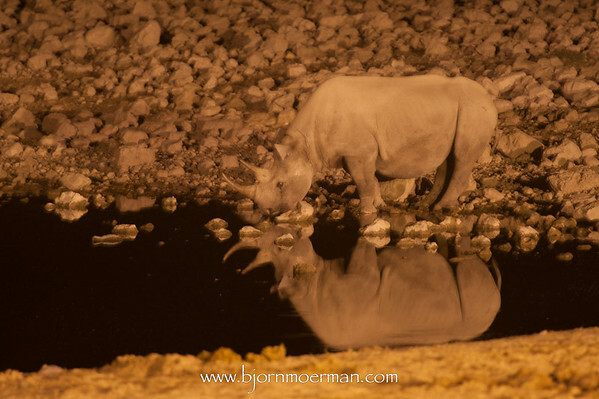 Even though the image above is not 100% sharp (due to animal movement and a longer exposure), I do like the atmosphere and the water mirroring of this black Rhino coming for a drink. My last image for today, shows the same place during the day. Click on the image for more details and select O (for Original) from the size menu, for a best viewing experience. 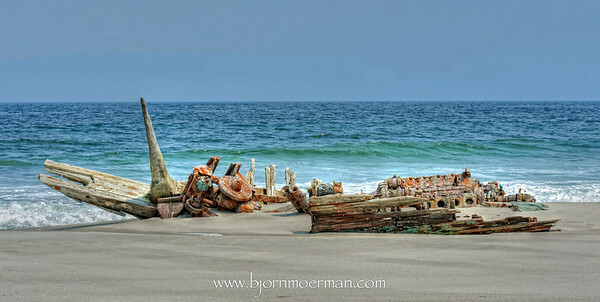 I've also just uploaded the rest of the Namibia -Beauty and the Beasts- images. Click here to view them. The next blogpost will concentrate on the landscape portion of the trip and should be complete early next week. Have a great weekend, where-ever you are, whatever you do! Earlier this week, friends in Dubai, invited me for a sunset boat-trip. Thanks Frank and Iris! Needless to say, I didn't say no... The weather had just turned from Summer to Fall, no falling leaves however, and the visibility was great! Every time, I go out there, I'm confronted with the fact how much Dubai has changed over the years. When I arrived here over 8 years ago, half of the buildings on the image below were not there. Twenty years ago there were only a handful, while less than thirty years ago, there was only the little Trade center building on the left. Amazing! I like how the wake of the boat, leads to the skyline. Just a small heading change by skipper Frank and I was done! Beside this image, I shot few more skyline panoramas, multiple images (4 to 6 shot vertical) stitched together in Photoshop. Click here for more. 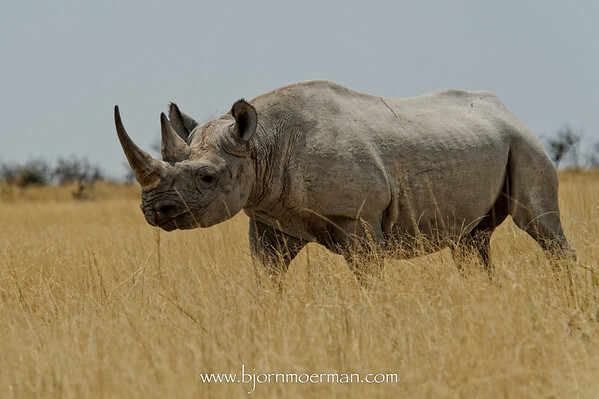 More of my Namibia -The Beauty and the Beasts- images should be online in 36hrs. Remember that following this blog is made very easy by clicking like on this Facebook page. My new photography book, 'FOCUS ON AVIATION" is now available for purchase! I'm excited about this book which is a collection of more than 100 of my best Aviation photography images taken all over the world. Unfortunately discount codes are only valid until November 2, 2010. Books are published by Blurb a high quality self publish book editor. I sell them for cost price and do not take any profit. Yes, not kidding! I strongly recommend ordering the hardcover and premium paper copies for an even better viewing experience! Todays post will be the first one in a series of posts on a wonderful trip we recently did to Namibia, formerly known before independence in 1990, as South-West Africa. It is one of the youngest countries in Africa and is the least populated country in the world with only 2.5 inhabitants per square km! No wonder, one can drive for hours without seeing anybody. The first half of the photo adventure was mainly orientated on wildlife photography while the second half was concentrating more on landscape photography. Today will be talking wildlife! Our two week trip started off in the Windhoek where we picked up a Nissan 4x4 equipped with a roof-top tent. The plan was to do about 50% camping and 50% overnights in lodges. Just 3 hours North of the capital we stopped for the night at the Okonjima lodge, home of the Africat foundation. 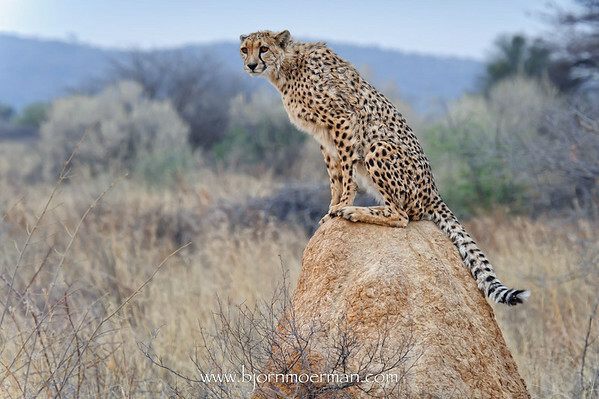 More on Okonjima and its beautiful Cheetahs on my Pic(k) of the week 40: Cheetah on the lookout blogpost earlier this week. The next morning we continued North-East towards the Waterberg National Park, an elevated plateau a few hundred meters above the Eastern Namibian plains of the Kalahari. 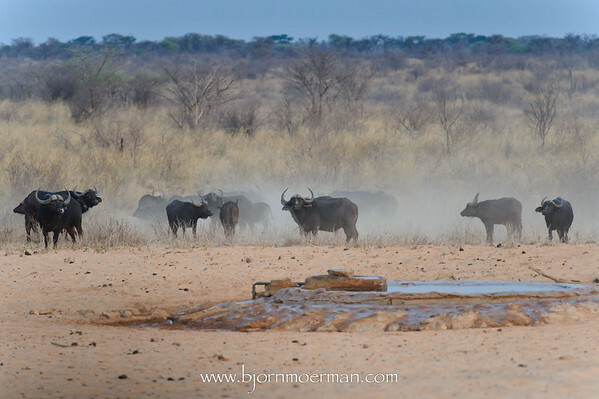 It is the only place in Namibia where one can find Buffalo, beside Rhino, Leopard, Elephant and Lion, one of the the Big 5 animals. And yes before you ask, we did see all of them and a lot more! We bumped into dozen of them drinking at one of the waterholes. One needs to be very careful approaching Buffalo since they are known to attack cars/people if they are pushed into a corner! Waterberg was one of the only places in Namibia where we had a guide showing us around. Unlike Etosha, individual cars are not allowed on the plateau. After an excellent night sleep in our roof-top tent, we headed towards Etosha National Park, one of the world finest game reserves and a highlight of our trip... Etosha, meaning "great white place", is dominated by a salt pan 130 km by 50 km and outlines a total of 850 km all the way around. The white saline dust covering a lot of the park, acts as an excellent light reflector. Since it was coming to the end of the dry season and water was scarce, animals were mostly seen at or close to one of the many waterholes. 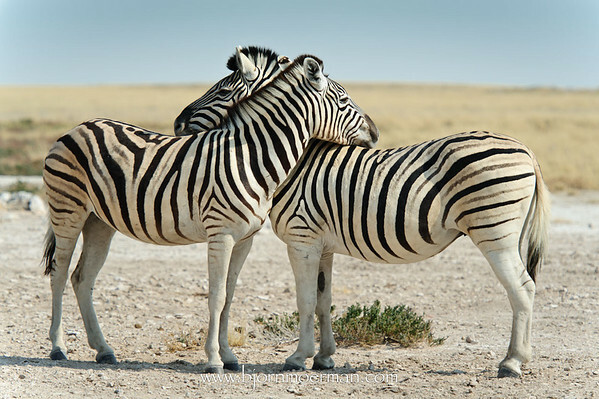 We spend a total of three nights in Etosha, one in every of the three main camps, Namutoni, Halali and Okaukuejo. Our second and third day in this wildlife paradise will be covered in part 2. As of today, I've uploaded about 40% of the images. More will be added towards the end of this week. 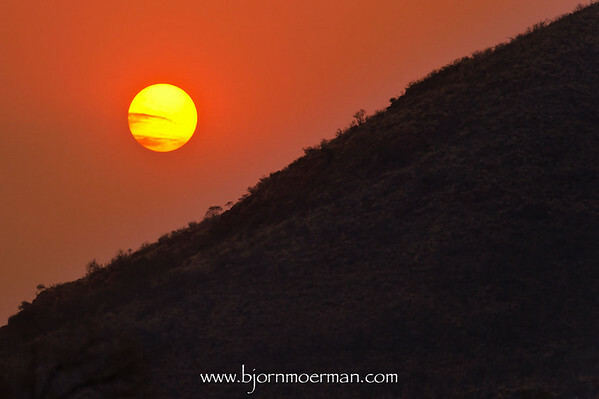 To view the Namibia images click here. Pic(k) of the week 41: The world is turning! I'm in the middle of editing 2000 images of a recent trip to Namibia. At times I find it challenging to remain focused on editing a large batch of images like these. Taking breaks and not rushing seems to be the key! Perfect time to write a post on something I tried for the first time, while in Namibia. We had finished dinner at a remote camping spot just under 2000 m altitude. The nearest city with streetlights was over 200 km or a 5 hour drive away. The air was cold and the moonless sky pitch dark and crystal clear. 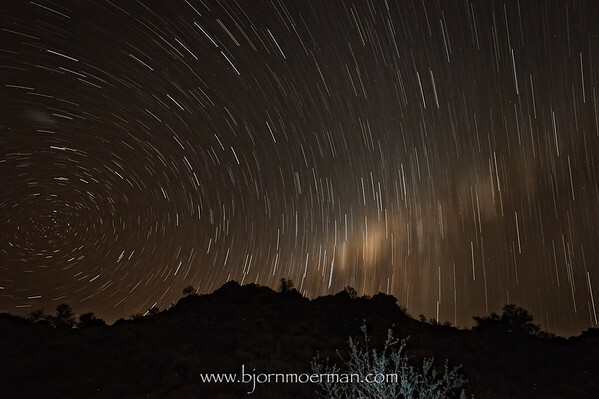 A perfect location for star trail photography! I had a vague idea how this was done, but it quickly became obvious that there would be some guessing. A quick online search would have helped a lot, but needless to say internet was not available at this remote location! I started setting up my Nikon D700 with the 14-24mm 2.8 lens on my sturdy Gitzo tripod and connected the remote cable release. Pressing the shutter manually should be avoided because of the introduction of camera shake. Most cameras limit the normal exposure time to a maximum of 30 sec. Using Bulb mode is the only way around it. In the Northern hemisphere one needs to point the camera to Polaris (the Northern star) in order to a have a good sense of motion. Being down under in the Southern hemisphere, I initially wasn't sure... It turned out (by trial and error) that one needs to center on the Southern star. The only problem is that there is no Southern star visible by the naked eye. The free iPhone app, "Stars" together my compass on my iphone saved the day. The lighter tones on the right hand side of the image are part of the Milky Way Galaxy. I initially tried a 15 min exposure followed by a 20 min one at f 5.6 aperture. It turned out too dark and found that 30 min was going to be the sweet-spot. I first found it a challenge to focus because of the lack of contrast in the very dark sky. It turned out that leaving the focus on manual and infinity would do the job just fine. Ideally, I should have opened the aperture up to f 4.0 or even f 2.8 to increase the exposure even more. Exposing the sensor during longer times (up to 1 hour) would have achieved the same but I was running out of time already. One does not want to increase the ISO above the minimum value because of noise issues in the shadows. Even with an excellent high ISO performer like the Nikon D700. Switching the in-camera noise reduction function ON, drastically helps reducing noise but also doubles time between two exposures. Taking a 30 min exposure, the camera basically needs another 30 mins to do the noise reduction. I also experimented a little with "painting with light". Using a normal flashlight I wanted to make the tree in the foreground stand out a bit more. 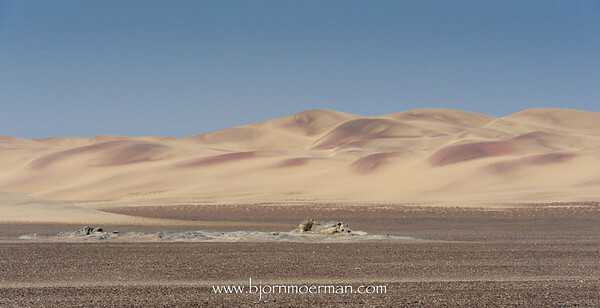 I do hope to start uploading more images of our Namibia photo-aventure in the coming days. I'm writing this post, while flying as a passenger between Windhoek,Namibia and Johannesburg, South-Africa. Unfortunately our 2 week Namibian photo adventure is coming to an end. What a great trip it has been! We crossed this beautiful South-West African country by roof top equipped 4x4, clocking over 3000km on its gravel and sand tracks. Being away from all modern forms of civilization like phones, TV, Radio and Internet has been very refreshing to say the least! 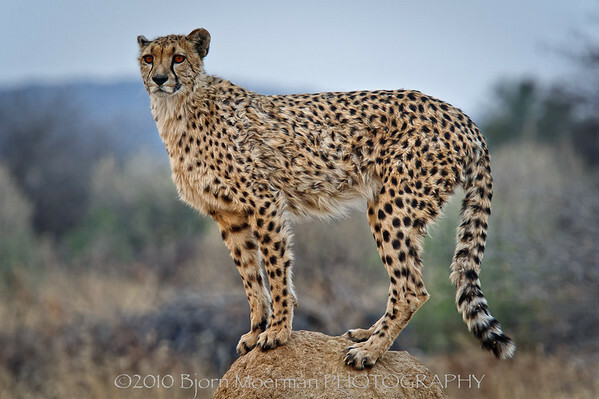 The image above was made on day 2 at Okonjima, the home of the Africat foundation, a non-profit organization 200 km North of Windhoek which rehabilitates wild Cheetahs and Leopards and releases them back into the wild. A great initiative! On a late afternoon game drive in the 22000 ha private nature reserve, we spotted this beauty standing on a 3 to 4 m high termite mount. A photographer's dream coming through! With its topspeed of 120km/h, the Cheetah is the fastest land animal on the planet, able to achieve 0 to 100km/h in 3 seconds, better than the best sports car! Using its tail as an aircraft rudder, it's able to take very abrupt turns. Editing the +2000 images will be the first priority. Once this process is done, I plan on publishing a series of detailed blogposts about my latest African photo adventure!